For sale by unidentified owner, Boston, 1841. Copley Amory [1841-1879]; his son, Copley Amory [1866-1960], Washington, D.C.; his wife, Mary Forbes Russell Amory [1870-1961], Washington, D.C., in 1929; their son, Copley Amory, Jr. [1890-1964], Cambridge, Massachusetts, in 1944; bequeathed to his nephew, Walter Amory [b. 1924], Wellesley Hills, Massachusetts; purchased 1965 by NGA with funds from the Avalon Foundation. When the painting was exhibited at the Boston Athenaeum, it was catalogued as "Mr. E. Tyng. For sale" (Robert F. Perkins and William J. Gavin III, The Boston Athenaeum Art Exhibition Index, 1827-1784 (Boston, 1980), 40, no. 59). The seller could have been a distant relative for whom the portrait had no personal value. Of Tyng's five children, only his daughter Sarah Tyng Winslow outlived him. After she died in 1791 without children, the sitter had no direct descendants; see Brother Anthony of Padua, The Tyng Family in America (Poughkeepsie, New York, 1956), 24-28, 51. Copley Amory, the artist's great-grandson, probably purchased or was given the portrait, since there was no family connection between the Amorys and the Tyngs; see John William Linzee, The Linzee Family of Great Britain and the United States of America [Boston, 1917], 2: 766, 781-782. Amory's ownership was first recorded in 1873. On Amory see Linzee 1917, 795 and his obituary, The New York Times, 18 April 1960, 29. The birthdates of Mary Forbes Russell Amory and Copley Amory, Jr., are found in Linzee 1917, 795-796. Their death dates were provided to Ellen Miles by Walter Amory, 19 November 1990. Ethel C. Amory (Mrs. Copley Amory Jr.) documented the gift of the portrait by Copley Amory to Mary Amory and then to Copley Amory, Jr. (letter 1 May 1965, NGA curatorial file). Walter Amory, letter, 19 November 1990, in NGA curatorial file. Boston Athenaeum, 1841, no. 59. Loan Exhibition of Portraits for the benefit of the Associated Charities and the North End Union, Copley Society, Boston, 1896, no. 59. Musuem of Fine Arts, Boston, 1910-1924. Exhibition of Early American Paintings, Miniatures and Silver Assembled by the Washington Loan Exhibition Committee, National Gallery of Art (now Smithsonian American Art Museum), Washington, D.C., 1925-1926, no. 11. John Singleton Copley, 1738-1815, Loan Exhibition of Paintings, Pastels, Miniatures and Drawings, Museum of Fine Arts, Boston, 1938, no. 74. John Singleton Copley, 1738-1815, National Gallery of Art, Washington, D.C.; Metropolitan Museum of Art, New York; Musuem of Fine Arts, Boston, 1965-1966, no. 53. John Singleton Copley in America, Museum of Fine Arts, Boston; The Metropolitan Museum of Art, New York; Museum of Fine Arts, Houston; Milwaukee Art Museum, 1995-1996, no. 74, repro. Perkins, Augustus Thorndike. A Sketch of the Life and a List of Some of the Works of John Singleton Copley. Boston, 1873: 19, 111. Loan Exhibition of Portraits for the benefit of the Associated Charities and the North End Union, Exh. cat. Copley Society, Boston, 1896: no. 59. Bayley, Frank W. A Sketch of the Life and a List of Some of the Works of John Singleton Copley. Boston, 1910: 99-100, 244. Bayley, Frank W. The Life and Works of John Singleton Copley. Boston, 1915: 244. Addison, Julia de Wolf. The Boston Museum of Fine Arts. 2nd ed. Boston, 1924: 5. Exhibition of Early American Paintings, Miniatures and Silver Assembled by the Washington Loan Exhibition Committee, Exh. cat. National Gallery of Art, Washington, 1925-1926: no. 11. Bolton, Theodore and Harry Lorin Binsse. "John Singleton Copley." The Antiquarian 15 (December 1930): 118. Shipton, Clifford K. Sibley's Harvard Graduates, Vol. 5 Biographical Sketches of Those who attended Harvard College in the Classes 1701-1712 with Biographical and other Notes. Boston, 1937: 651-653. John Singleton Copley, 1738-1815, Loan Exhibition of Paintings, Pastels, Miniatures and Drawings, Exh. cat. Museum of Fine Arts, Boston, 1938: no. 74. Parker, Barbara Neville and Anne Bolling Wheeler. 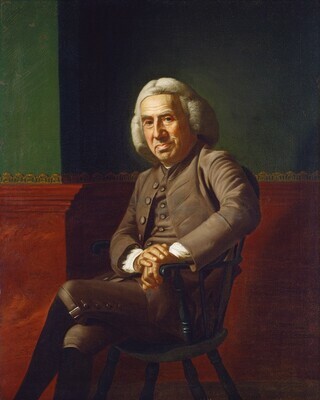 John Singleton Copley: American Portraits in Oil, Pastel, and Miniature with Biographical Sketches. Boston, 1938: 190, pl. 111. John Singleton Copley, 1738-1815, Exh. cat. National Gallery of Art, Washington; Metropolitan Museum of Art, New York; Musuem of Fine Arts, Boston, 1965-1966: no. 53. Prown, Jules David. John Singleton Copley, vol. 1. Cambridge, MA: Harvard University Press, 1966, pp. 85, 88, 92, 115, 194, 231, fig. 317, no. 52. American Paintings and Sculpture: An Illustrated Catalogue. National Gallery of Art, Washington, 1970: 46, repro. Walker, John. National Gallery of Art, Washington. New York, 1975: 390, color repro. fig. 563. American Paintings: An Illustrated Catalogue. National Gallery of Art, Washington, 1980: 138, repro. Williams, William James. A Heritage of American Paintings from the National Gallery of Art. New York, 1981: 22, repro. 23. Walker, John. National Gallery of Art, Washington. Rev. ed. New York, 1984: 387, no. 548, color repro. American Paintings: An Illustrated Catalogue. National Gallery of Art, Washington, 1992: 149, repro. Miles, Ellen G. American Paintings of the Eighteenth Century. The Collections of the National Gallery of Art Systematic Catalogue. Washington, D.C., 1995: 36-38, color repro. 37.